Focusing our efforts on developing and commercializing the use of sustainable nitrogen in agricultural applications, Azotic North America’s management and scientific teams work to revolutionize world food production methods. 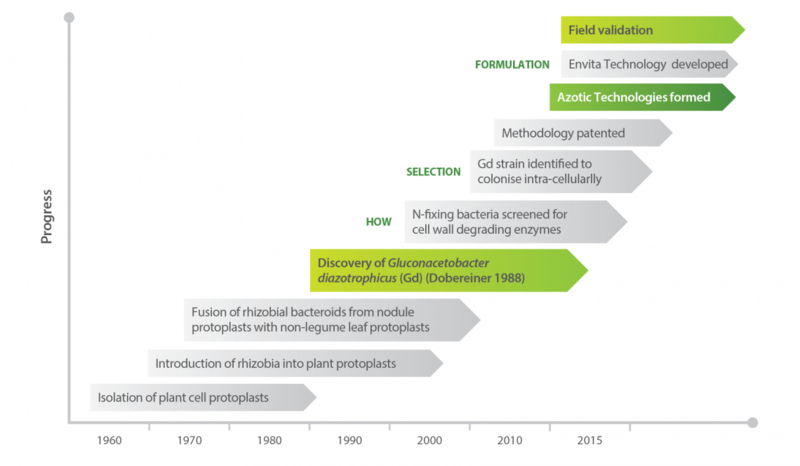 After nearly 20 years of research, Azotic Technologies leading researcher, Professor Edward Cocking FRS, pioneered the development of a nitrogen-fixing bacteria, allowing farmers to enjoy reduced production costs while protecting their local environments. With this n-fixing technology, our advances in agricultural science have been globally recognized for their part in sustainable farming practices. Fundamentally benefitting producers of all crop types, Envita™ promises a viable, affordable alternative to synthetic fertilizers. The core of the science lies in inoculating plant seeds with food-grade bacteria, Envita, creating a symbiotic relationship between the seed and the bacteria, which allows almost any crop to fix its own nitrogen and boost yields while relying less on nitrogen fertilizer. With this revolutionary nitrogen fixation technology, your rice, wheat, soybean, or corn crops could replace 25-50% of their nitrogen needs, or maintain your N fertility program with the intention of producing higher yields. Fill out our Envita registration form to get started.